Arthur White was a world champion power-lifter, a successful businessman, and a happy family man, until his life spiralled out of control. Cocaine, steroids, and an affair changed everything. Arthur lost his business, family, and his own health was severely threatened. Death seemed the only way out until an incident with a knife.....Arthur's life story is straight out of the annals of crime thriller and his conversion to the Christian faith dramatically demonstrates the reality of God's amazing grace. 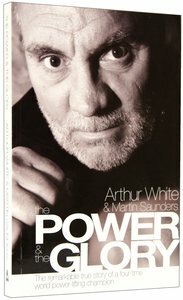 - Publisher Arthur White was a World Champion power-lifter, a successful businessman and happy family man. Until his life spirals out of control. Cocaine, steroids and an affair change everything. Arthur loses his business and his family and his own health is severely threatened. Death seems the only way out until an incident with a knife...Arthur's story is straight out of the annals of an East End crime thriller and his conversion to the Christian faith dramatically demonstrates the reality of God's amazing grace. About "The Power & the Glory"
Arthur White was a World Champion power-lifter, a successful businessman and happy family man. Until his life spirals out of control. Cocaine, steroids and an affair change everything. Arthur loses his business and his family and his own health is severely threatened. Death seems the only way out until an incident with a knife...Arthur's story is straight out of the annals of an East End crime thriller and his conversion to the Christian faith dramatically demonstrates the reality of God's amazing grace. Martin Saunders is editor of Youthwork magazine and a leading member of the Youthwork network. He is a film buff and a soccer fan.